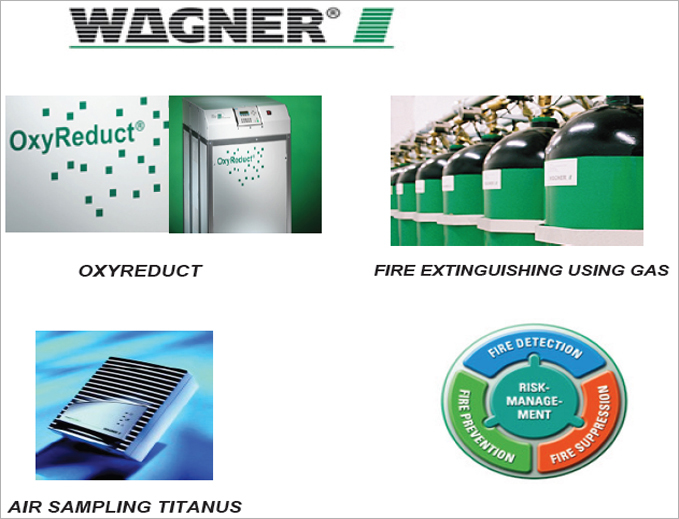 • WAGNER offers comprehensive fire prevention solutions in the fields of fire detection, fire fighting, fire prevention and total risk management. • In order to fulfil the specific demands of our customers in fire prevention it is often necessary to offer more than conventional concepts. New problems require innovative fire prevention solutions. • Since 1976 the WAGNER name stands for bespoke concepts in fire detection, fire suppression, fire prevention and fire risk management. • Permanent innovation, modern research and development and professional engineering lead to state-of-theart products and systems offering our customers the ultimate in fire prevention. 1- Very early smoke detection using WAGNER Air sampling smoke detection Systems . 2- Extinguishing gas, WAGNER has a wide range of apprpved gas extinguishing system allawing the most suitable system for the particular application . 3- OxyReduct® is an innovative fire prevention system, " Action replaces reaction ", for the first time in the history of fire prevention. This is achieved by introducing a regulated supply of Nitrogen into the risk area, which reduces the Oxygen level. 4- Integrated fire risk management and information system VisuLAN® provides an effective solution, allowing the networking of all independent systems, such as but not limited to ; smoke detection, fire extinguishing, intrusion detection and access control systems to creat an integrated overall solution.